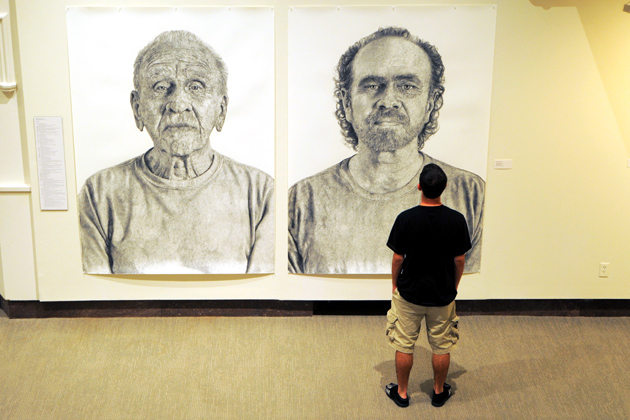 Stephen Quesnel ’14 views charcoal portraits at the Benton Museum of Arthur, left, and Ralph (Ray) by Ray Di Capua, an associate professor of art and art history. The School of Fine Arts encompasses the Departments of Art and Art History, Digital Media and Design, Dramatic Arts and Music. The curricula in each department afford not only an intensive professional education, but a liberal university education as well. See Admission to the University and Department Guidelines. The University Senate has adopted General Education Requirements in a variety of curricular areas that must be satisfied as part of every bachelor’s degree program. These requirements appear in the General Education Requirements section of this Catalog. Courses may be used to meet both School of Fine Arts and University requirements. Fine Arts students (with the exception of Art History and Theatre Studies majors and Digital Media and Design students enrolled in the Bachelor of Arts program) must enroll in a minimum of six credits in major department courses (Art and Art History, Dramatic Arts, or Music or Digital Media and Design courses for students enrolled in the Bachelor of Fine Arts program) each semester of full-time study unless an exception is granted by the Director of Advising. Students who fail to comply with the minimum credit requirement are subject to dismissal from the school. met all the requirements listed above for the specific degree taken. Students who desire to be excused from any of the requirements or courses should consult the pertinent department head and Eva Gorbants, Assistant Dean. The School of Fine Arts offers interdisciplinary minors in Digital Arts and Global Arts and Culture. They are described in the Minors section of this Catalog.